Let's start with how AFT Section 11.07 General Purpose Portion of their plan, which is where the road initiatives are specified. Did you see what they did? The funding for the General Purpose category can also be used for "public transportation", or transit. Conversely, AFT explicitly requires the 45% dedicated to transit later in plan to only be used for transit and nothing else. Cited directly from the plan, this category is estimated at $1.7 billion, or 10.8% of the nearly $16 billion in the plan over the 30 year lifetime of the tax. This category is already largely funded with existing gas taxes, although we have our complaints with Hillsborough County's effectiveness with these monies. Which begs the question, what happens to these existing funds? A topic for another day. Cited directly from the plan, "Safety" will cost nearly $2.3 billion or over 14.5% over 30 years. Cited directly from the plan, "Transportation Network", or a fancy word for bike paths and sidewalks, and more safety, is estimated to cost $1 billion, about 6.5%, over 30 years. Cited directly from the plan, the "Remaining" category, is estimated to cost over $1.2 billion, or 8.1% over 30 years. Note this category can be used for "any project to improve transportation", which would include any of the other categories above, as well as the transit categories (we will take those up in another post). The "Remaining" funds can only be used on those "permitted by F.S § 212.055(1) AND this Article". The Article means the entirety of the charter amendment that intentionally excludes new roads. The $16 Billion tax hike does not and cannot fund any new road capacity - for 30 years. Cited directly from the plan, sections 11.07 (1 - 3), or about $6.2 billion over 30 years, are restricted from actually increasing capacity. Recall section 11.07(2) Congestion Reduction, excludes new lane capacity, the best way reduce congestion. 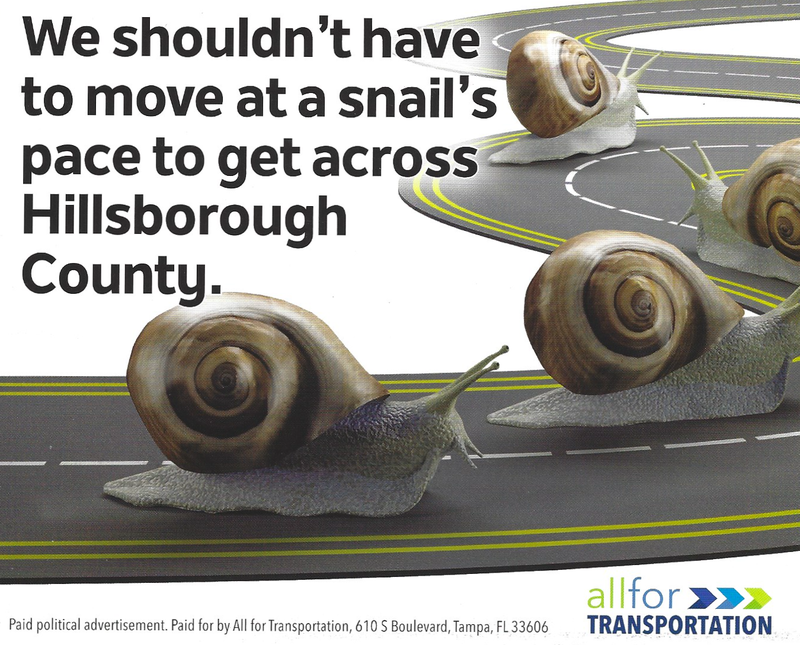 We agree with AFT that an estimated 700,000 new residents expected to move into Hillsborough County over the next thirty years -- with their cars. How many new cars will be on the road? Well, I'm glad you asked. If we use the average household size of 2.64, Tampa's average of 1.49 cars per household, there will be an estimated 395,075 more cars on the road, or about 50% more than are now in Hillsborough due to the 700,000 new residents. 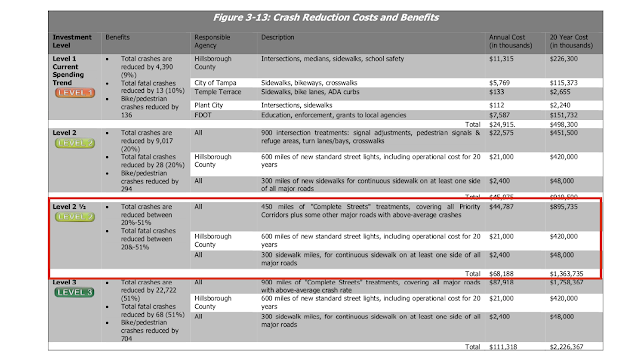 The Tampa transit advocates who authored the plan clearly gave a lot of thought on exactly what they want, which included explicitly ignoring new road capacity. 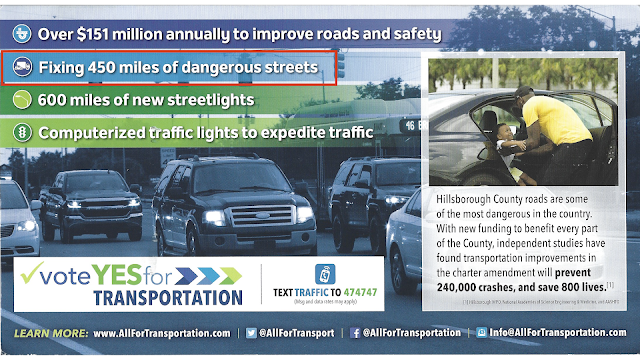 This is a recipe for disastrous gridlock for Hillsborough's future. Yet AFT must spend a minimum of $1 billion on bike paths and sidewalks, but could spend nothing on new roads! Got that?! 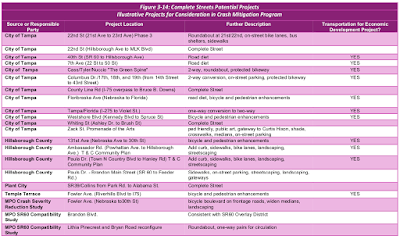 Complete Streets are not complete in increasing traffic throughput. In fact, they are based on creating more traffic congestion by slowing down and constraining traffic. Road diets, or actually reducing road capacity, is the term the MPO uses. Don't believe me? 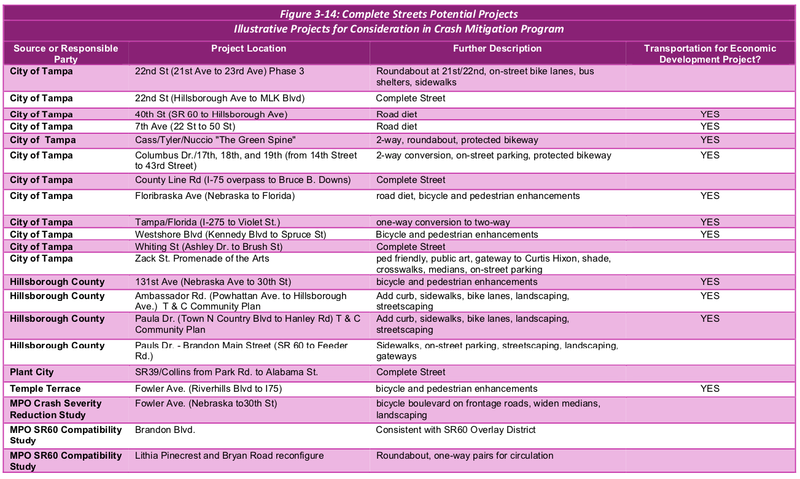 Check out the "illustrative" road diets from the MPO. Complete streets and "road diets"
Where does the space for more and wider sidewalks, transit, trees, bike paths come from? By reducing and removing lanes available for the most popular mode of mobility, your car. Do you see what they did? They are playing the "safety" card without recognizing the rest of the impacts of their plans. We are all about safety. In fact, we would advocate for even more safety with increased separation for bikes and pedestrians, with separate bike and pedestrian trails away from major roads. There are few good outcomes involving automobiles and bikes or pedestrians regardless who is at fault. Yet there is no evidence there will be a major increase in bikes and pedestrians over the 30 years in this plan. But they are committed to spend billions regardless. Not only does the AFT plan consciously ignore the need for new road capacity, they are explicitly seeking to further constrict another 450 miles of road capacity with "Complete Streets". There is no magic here. Reducing capacity for the mode of transportation well over 90% of the residents of Hillsborough prefer will increase congestion. The "non-impact fee revenue" includes sales tax revenue. Therefore, the AFT sales tax will reduce mobility fees by 30% or more. The developers will be paying less for the impact of new development and you will be paying more! The AFT plan, hiding clearly in its language, will only increase congestion faster. They do this by over allocating funds to transit, explicitly not funding increased road capacity, forcing "road diets" on 450 miles of complete streets, all while another 700,000 residents arrive with their 395,000 cars, while making you pay more. And wait more. The part about not building new roads is just saying the money being used for safety and improvements in those other points 11.07 (1 - 3) must be specifically used in those ways when allocated to the various agencies dealing with transportation improvements. It looks like you can build or widen roads, just not with the money given from the buckets meant to improve roads. Some interesting manipulation you are doing with this article. They clearly have specified 9 different categories of spending, none of which explicitly specifies new road capacity, and one section that excludes new road capacity. Either they did that on purpose, or they did that on purpose. The 11.07(5) section use towards new road capacity at best is not guaranteed (on purpose), and at worst, as we explain above, since nothing else for new road capacity is specified elsewhere in the "Article", with the power of "and", none of the "Remaining Funds" can be used for new capacity. Why is the last section not guaranteed? Nothing in that section says anything about how it cannot be used to build roads. It looks as if their plan is prioritizing safety and improvements and then local governments across the county will still be able to use the money from the 11.07(5) bucket for new or widened roads if they so desire. Nothing in 11.07(5) says it must be used for road capacity. It can, and will be used for anything and everything else. Also, the legal definition of "and" in reference to the "Article", as in "and to the extent permitted in this Article", when the article (aka, the amendment) does NOT specify any new road capacity, the municipalities may not be allowed to use these funds for new capacity.